What kind of pie NEVER gets smaller, no matter how many pieces you cut out of it? 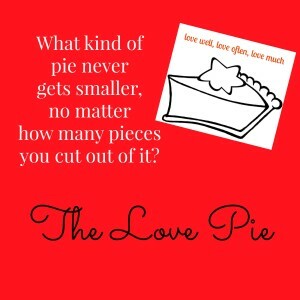 The Love Pie is something I came up with years ago during a conversation with my niece, Kelsea. She was unsettled because another family member was coming to visit me – a young girl just about her own age. Kelsea was looking for reassurance that I loved her (best) and seemed concerned that this other little girl would be more important to me than she was. She had nothing to worry about. Ahhhh, but what a great teaching moment. In my attempt to explain how love worked, the Love Pie was born. A unique pie for sure because no matter how many pieces you cut out of it, AKA how many people you love, there is ALWAYS enough to go around. (Remind you of another story?) Whether the pie is divided into 6 pieces or 16, the size of the piece does not determine how much love you have to give, nor how much love remains to share. As the pieces get smaller with each additional slice cut, there is no reduction in love to go around. Regardless of size, one piece DOES NOT negate or devalue another. Love NEVER runs out! There’s no reason to be jealous or insecure because your piece of the pie is safe and secure. There’s nothing to worry about – ever. Your love is protected. My conversation with Kelsea made me think of how insecure we can get. We not only feel jealous of others who we share time and attention with in someone else’s Love Pie, but there are also those envious of who we share our affections with in our own Love Pie. It can get really uncomfortable, cause major problems, and even become downright vicious! And this is in NO WAY limited to just children. Adults can have their fair share of anxiety about this and engage in undesirable behavior as well. I need only to think of my relationship with my sisters. Boy, talk about a balancing act. 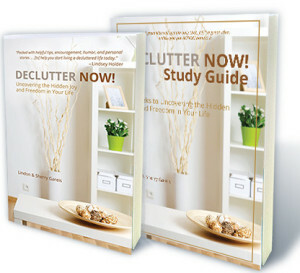 NO ONE wants to be left out – EVER! In the past, if one sister was at another’s home but didn’t invite the rest, that was war! Did three go to a movie and leave the fourth out? BIG PROBLEM! Even if the fourth couldn’t go…and the others all knew it…it was an unspoken rule to ask anyway – or else! Thank God we’ve come a long way from those emotionally draining times! Kinda. LOL…. How about kids vying for Mom or Dad’s attention? That can get ugly – fast! Years ago, we even harassed our Nana mercilessly, begging her to tell each of us that WE were her favorite. Being the great sport that she was, she’d play along time and time again. Whoever happened to be in front of her at the time was, of course, her favorite! If another sister happened to be within earshot and heard such an exclamation, she would come running in to contest. Boy did we laugh…and laugh…and laugh….often until Nana’s poor teeth would fall out. We had a lot of fun with it, but the truth was, underneath the laughs, we each wanted to be her favorite – ‘for reals’! Too bad for the rest of them I was truly Nana’s favorite… She told me so and I KNOW she meant it! In-law dynamics aren’t any easier. Not only do we have our kids to juggle, but when they got married, the equation doubled. Bring grandkids on board? The challenge grows to an exponential proportion. How about our kids’ in-law families? Holy cow, there are so many people to love. And deal with! When our first two grandbabies were born I sat their Mommas down and issued a stern warning. “I love BOTH of you girls the same and BOTH of my grandbabies the same. If either of you EVER fight about this or stress me out over it, we are going to have a problem!” Again, we laughed, but they knew I was serious. I couldn’t pick one over the other if I tried…so pretty please, don’t challenge me to do so! Each grandbaby (and Daughter-in-Law for that matter!) is special, each is adored, and each means the world to me. And to really top off the conversation, think about situations which involve ex-spouses. How many children of divorce are plagued with making sure each parent feels loved and important? What a burden to place on these innocent victims. If each party involved understood and believed in the Love Pie theory, there would be less competition and heartache, and so much more joy. Isn’t that the least we can do for our kids? Who cares who got to meet the new girlfriend first?! Who cares who gets the actual graduation night dinner celebration and who takes the next night?! Who cares who bought the most expensive present?! Jealousy can be quite unattractive. And exhausting. Instead, simply concentrate on YOUR piece of your child’s Love Pie and appreciate, nurture, and enjoy it. If you do this, the rest of the angst will quickly fade away… Focus solely on your relationship with each person and be the best YOU can be. Following God’s example is a great start to finding security in your own little piece and instilling the same in those you love. Who is ‘the world’? It’s the ENTIRE collective body of believers. Who is ‘us’? Yup, you guessed it. ALL believers. God doesn’t say that Christ died for the ONE who gave him the most presents or who spent the most time with him. He said for US. All of us! God didn’t just choose his favorites and ignore the rest or treat them like garbage. God loves EVERYONE in his Love Pie, and honestly, how many pieces has he cut? We each have the security of knowing that we are just as special to him as our neighbor is. He has promised us this and by faith we believe. But how do we, imperfect as we are, mirror God’s example on this? For those we love, we have the responsibility of loving with honor, respect, compassion, honesty, trust, and kindness. For those who love us, we should concern ourselves only with our relationship with that person. We shouldn’t worry who they were with yesterday and what their plans are with another tomorrow. If they are treating us with love and respect, then we need to check ‘other worries’, like jealousy, off our list. Stop obsessing about the ‘competition’, because if we don’t see them as such, they won’t be so. For those who don’t ‘share’ and understand the Love Pie concept, we pray. We only have control over our own behavior, and that needs to be our focus. Outside of that, we pray for hearts that are insecure, jealous, demanding, selfish, or otherwise unfair. Pray for a renewing of their hearts and minds, a peace to wash over them, and a security in love and life that surpasses their understanding. It’s not easy. As a Sister, Mom, Mother-in-Law, Grammy, Mimi, niece, cousin and friend of many, it takes awareness, effort, and discipline. I am constantly inviting the Holy Spirit in to guide me and speak truth into my life. Left to my own devices, I sure make a mess of things. I have learned to worry only about MY ‘piece’ of the Love Pie – both in the piece I am giving to someone, and in the one they are giving to me. Remember, there is enough love for EVERYONE. With honorable intentions and heart motive, the amount of love in each piece won’t be reduced by the number of people each person has to love. Baked right, there will ALWAYS be enough Love Pie to go around. This entry was posted in Uncategorized and tagged affection, attention, cousin, family, God, in-law, jealous, jealousy, love, mom, secure, sister, Valentine's Day. Bookmark the permalink.